Today, Marvel is proud to officially peel back the curtain on one of Marvel’s can’t-miss Free Comic Book Day offerings! Saturday, May 2nd, meet the new roster of Earth’s Mightiest Heroes and prepare for the next epic chapter of Charles Soule’s Inhumans saga in ALL-NEW, ALL-DIFFERENT AVENGERS FCBD! 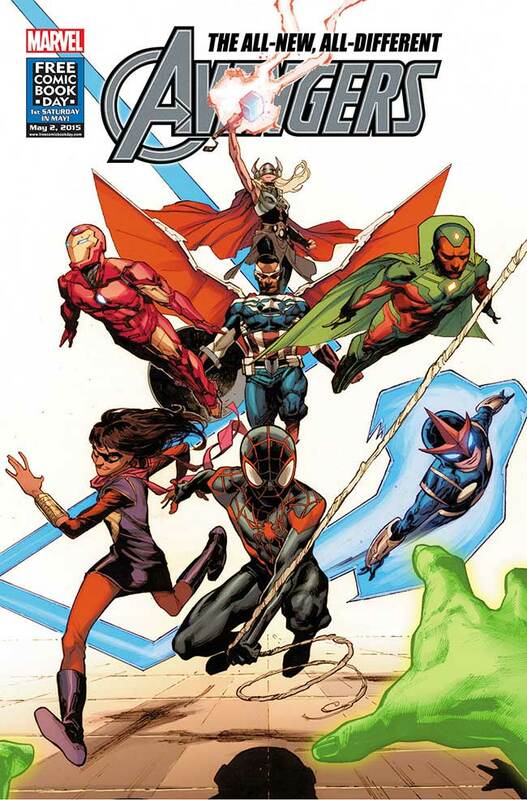 Get a look into the Avengers of tomorrow with the All-New, All-Different Avengers! Eisner-award winning writer Mark Waid (Daredevil, S.H.I.E.L.D.) and All-New Young Guns artist Mahmud Asrar (All-New X-Men) take this new squad for their very first spin! 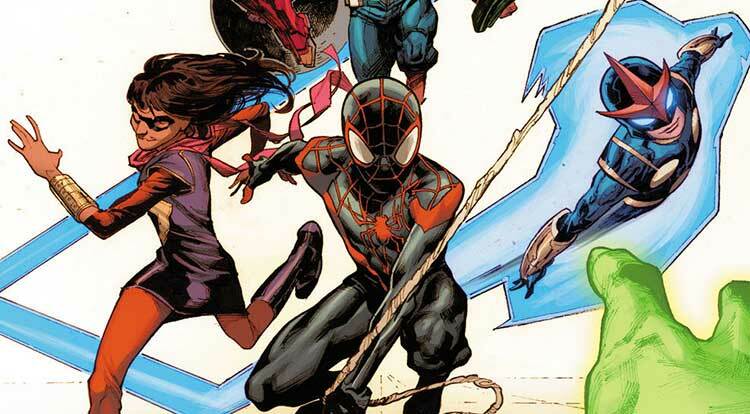 Newcomers Nova, Miles Morales, and Ms. Marvel join Captain America, Iron Man, Thor, and the Vision for a team of Avengers unlike any you’ve ever seen before! Then, blockbuster Death of Wolverine scribe Charles Soule joins artist Brandon Peterson (Age of Ultron) to lay new groundwork for the future of the Inhumans. 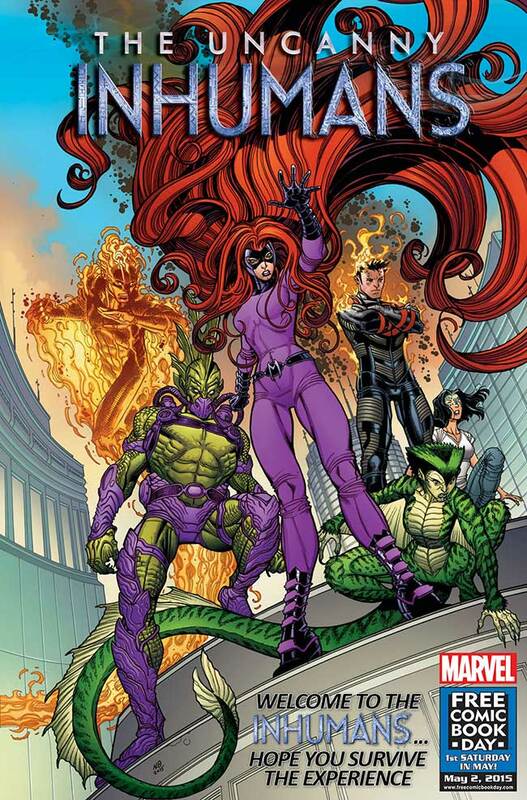 As the Terrigen Mists continue to awaken new Inhumans across the globe – it’s up to Medusa and her squad to protect them from a world that would use their new powers for evil. And why is Johnny Storm, the Human Torch now counted among their ranks? Plus, don’t miss Marvel’s other exciting FCBD offering, Secret Wars #0 – the epic prelude to the biggest comic event of the year, just in time for the release of Secret Wars #1 the very next Wednesday! The future of Marvel begins on FREE COMIC BOOK DAY! Be there as the All-New, All-Different Avengers assemble for the first time and the Uncanny Inhumans embrace the Marvel Universe of tomorrow! No fan can afford to miss both of Marvel’s Free Comic Book Day titles – in stores on May 2nd! Next Article Spider-Island returns to the Warzones!